I am not a green thumb by any means, as evidenced by the cactus that died in my care. 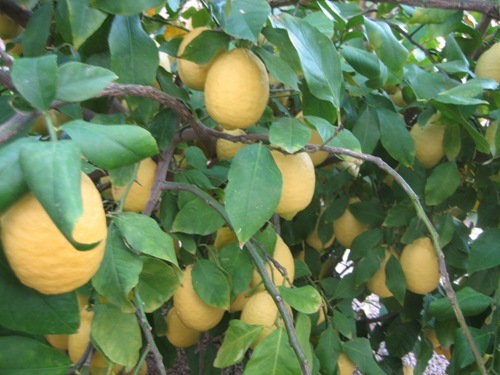 I just can’t believe the lemon tree we planted is bearing so much fruit! Come to think of it, I can’t take any credit for this. I’ve done nothing. It’s flourishing on its own. If it weren’t for the irrigation system, it’d be dead because I’d forget to water it. 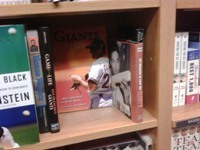 That means rearranging the baseball section of the bookcase, where he grabs copies of my Giants book, pushes the others out of the way, and then puts mine back in with the front cover facing forward. Then he takes a picture of his handiwork with his BlackBerry and emails it over to me. Just this past week, I learned that my cousin Clarence does the same thing when he’s at a Sacramento Barnes and Noble near his workplace. I love my family. They go to the book store, buy whatever it is they’re looking for – the latest bestseller, a magazine, maybe a cup of joe – then they go and see if my book is in stock, and if it is, they give it some love. The problem with this redecorating is that you can get caught doing it. That was the case two Decembers ago when Little M was in a San Jose Barnes and Noble, where the book was actually on the aisle tables at the front of the store. Prime real estate, yes, but apparently not prime enough for Little M because she impulsively began to move my book from the back of the table to the front. And as she was doing so, an employee – who was right to be alarmed – asked what in the world did she think she was doing? “My dad wrote this book and I just wanted more people to be able to see it,” she told the employee. Amazingly enough, the employee accepted that answer and let her do her thing. This is guerrilla marketing at its best. The hardcover came out in 2005. And the paperback, which was slightly updated, came out in 2007. I’m just happy the book has had such a long shelf life. One of the treats of living in Arizona is near year-round baseball. Here’s the Giants’ Kevin Frandsen getting a hit off the Yankees’ Phil Hughes in a mid-November Arizona Fall League game in Scottsdale. I shot this half-minute video with my tiny digital camera, assuming Frandsen would do something good with his at-bat, and he did! A few Sundays ago, I was in a small Scottsdale club to catch Kate Voegele, and the crowd was dominated by teens and twentysomethings. There were some thirtysomethings, people in my age group. So it was a nice mix. But as two opening acts came and went, and Voegele was halfway through her set, I noticed that the people my age hung back. They seemed incredibly bored. Some paced. Some sat on bar stools in the corner. I couldn’t figure them out. And then I realized, with a bit of horror, that these people were parents and were simply there to chaperone their kids. Last Wednesday, sure enough, a foul ball came my way. A line drive, hit hard, screamed toward me from several hundred feet away like a heat-seeking missile. My initial thought was: holy sh–. It’s coming my way! Wait, it’s going to hurt! But I can catch it!